A Safe and Fun Way to Decorate With Candles. Moving flame technology by provides one of the most realistic looking flameless candles on the market today. What's the secret - watch as the light dances and flickers across the flame piece of the moving flame candle, providing a soft glowing effect. Created by Disney for their Haunted Mansion ride, the moving flame technology will make you swear you're looking at a real wax candle. The built in timer automatically turns the flameless candle off after 5 hours of use and turns it on again 19 hours later. The sturdy shell of the candle is made of unscented ABS plastic and is for indoor use only. flameless candles are a safe alternative to real wax candles. Now you can enjoy candles in your home without the worry of a fire hazard. Perfect for use around pets and kids. Add a beautiful touch of light to weddings, mantels, tablescapes, centerpieces, holiday displays and more with these votive flameless candles. These votive candles add a special touch to your decor throughout the year. Additional Features: 175 hour run time per candle per set of batteries. Remote ready. Remote NOT included. Made of ABS plastic with an ivory finish. Unscented. 5 hour on, 19 hour off timer included with candle. Requires 2 AA batteries per candle. Batteries NOT included. For indoor use only. Compare to Liown Candles. Includes two 1.75"x3" votive moving flame candles, one timer per candle. Light dances and glows on the moving flame piece. 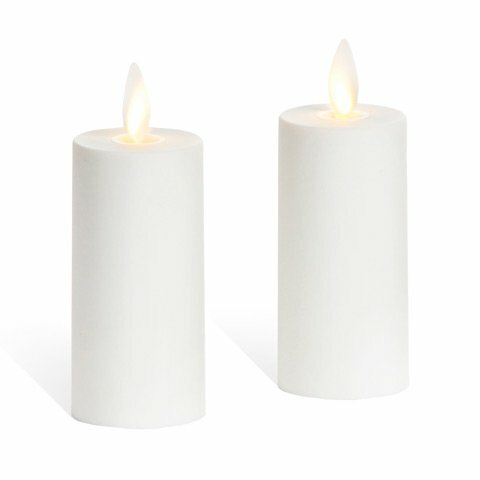 Provides a flickering effect similar to real wax candles. The timer on these flameless candles works on a 5 hour on, 19 hour off schedule. Allows you to set it and forget it. Works with standard candle remotes. Perfect for activating the votive flameless candles in hard to reach settings. votive candle made of ABS plastic. Indoor use only. 175 hour run time per each flameless votive candle per set of batteries.